Smadar Perry has an illuminating conversation with an well-placed academic in Iran, who shares his thoughts on – and interest in – Israeli society, as well as the true powerbrokers of the Middle East, his own country and America’s reversal on the nuclear agreement. My interlocutor shifts the conversation to he topic of Saudi Arabia. “What has been happening there since the murder of journalist Jamal Khashoggi is very good for Iran, and we believe the time is coming when Saudi Arabia will try to make an unofficial move in our direction. By the way, it is true that the number of executions in Iran is greater, but there has been no international outcry about this like there was in the case of the Saudi journalist,” he says with satisfaction. “I know who your politicians are, listen to reports about your military plans with great interest, but I am most interested in learning about life in Israel, how the society is structured, Sephardi versus Ashkenazi,” he says, exhibiting an impressive amount of knowledge. “Adults and young people, trends, culture, even your legal world fascinates me.” He does not see a big difference between young people in Iran and young people in Israel. My interlocutor tells me that it is allowed to be critical of the regime in Iran to criticize: “All of them, except for Supreme Leader Khamenei or the senior commanders of the security services,” he says. Now it’s the turn of the military commanders to set the tone, I say. Instead of the United States and European countries, he explains, we got China. Oil exports to China stand at 700,000 barrels a day, about a third of the country’s oil. David Albright is as concerned as ever about Tehran plotting to obtain a nuclear bomb and emphasizes the need for Israel and the West to stand watch. Nearly all of Iran’s advanced centrifuges used for enriching uranium potentially towards a nuclear bomb are failing, one of the world’s leading nuclear weapons experts revealed to The Jerusalem Post this week. Many have been worried that if Iran succeeds in developing advanced centrifuges, the machines which spin rapidly to enrich uranium, it could “sneak out” a nuclear weapon in a matter of weeks without being detected. The expert, David Albright, is a former International Atomic Energy Agency (IAEA) Action-Team inspector, head of the Institute for Science and International Security think tank on nuclear weapons and is close to CIA, Mossad and IAEA officials. His update on the issue closes off one of the many concerns about the nuclear deal – which is ironic since he is generally viewed as a hawk on Iran. But it is significant, Albright explained to the Post, in order to invest resources in tracking the other very real threats to watch out for regarding Iranian centrifuges and Tehran’s potential for developing nuclear weapons. There have been a range of debates about Iran’s nuclear program and the loopholes in the 2015 Joint Comprehensive Plan of Action – known as the Iran nuclear deal, which the US withdrew from last May – which could allow the Islamic republic to continue advancing towards a bomb without violating the agreement. One of the hottest issues has been that the deal allows Iran to continue experiments on advanced centrifuges. In a nutshell, advanced centrifuges like the IR-8 are potentially 16 times more powerful to enrich uranium compared to the simple IR-1 centrifuges that Tehran possessed prior to the 2015 deal. “The IR-8 has been a failure,” Albright said. “The centrifuge uses carbon fiber bellows, which involve carbon fiber tubes connected by a movable part, the bellows. They go into the shape of a banana when they hit a certain speed. You need to make them bendable. The bellow must be flexible, but they are made of carbon fiber so there are lots of problems with them cracking,” he said. If the IR-8s worked properly, they could spin at a much faster rate and enrich uranium more rapidly. Even with Iran’s less advanced IR-1s, inspectors have found that 20%-30% of them regularly fail. This may be why it took so long for Tehran to get suspicious about its centrifuges failing upon being infected with the Stuxnet computer virus in 2009-2010. Despite this failure, Albright said that Iran works hard to make a public showing that it is succeeding. In September, Iranian nuclear chief Ali Akbar Salehi made waves worldwide, when he announced that a new facility to produce advanced centrifuges at the Natanz nuclear plant had been completed. To the untrained eye, the centrifuges in the background of a photo of Salehi seemed to bolster the seriousness of his claims. But to the trained eye, Albright said that the show was totally superficial, and if anything, exposed Iranian failures. He said that the centrifuges were easily identifiable as IR-6’s – due to their single rotor tube and the absence of a bellow – all of which have failed to date. Yet, after describing all of these failures, Albright is as concerned as ever about Tehran plotting to obtain a nuclear bomb and emphasizes the need for Israel and the West to stand watch. He said that Iran has had success with the IR-2m centrifuge, which is three to four times more powerful than the IR-1 model, and that the Islamic republic regularly discusses its future aspirations to build tens of thousands of centrifuges. Since Iran “can never do that at a cheaper price than what they can buy” from Russia for civilian nuclear uses, its desire for a larger volume of centrifuges “makes no sense at all” for anything other than a nuclear weapons program. Albright noted that inspectors found slots for 3,000 IR-2m centrifuges in one of Iran’s facilities. However, he warned that the inspectors never clarified whether Tehran had built and concealed such a large quantity of higher-quality centrifuges, or whether its scientists only got to the point of making the slots, but not producing the machines themselves. All of these pieces of evidence form “a strong argument against [the truth of] Iran saying it has a civilian nuclear program,” he added. The nuclear weapons expert said that these pieces of evidence led the US, France, England and Germany to agree in early 2018 that if “Iran scaled up its enrichment program, that would be viewed as a military program,” and a way to say that Iran had violated the agreement – and sanctions, therefore, needed to be re-imposed. Albright said that Tehran’s behavior surrounding advanced centrifuges, even with their failures, has left even the Europeans “feeling that they want to make nuclear weapons.” He hopes that this will eventually lead the EU to take a tougher stance on Iran. Iran on Saturday unveiled a new cruise missile amid events marking 40 years since the 1979 Islamic Revolution. 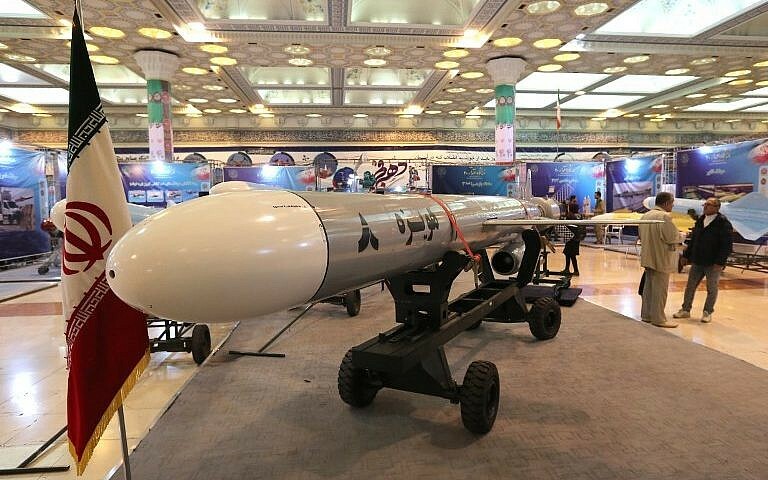 #Iran on Saturday unveiled ‘#Hoveizeh’ long-range cruise #missile which has been fully designed and manufactured by the country’s #military experts. The cabinet Said Hariri has formed in Beirut after a nine-month stalemate is a façade. The most powerful portfolios have gone to pro-Iranian Hizballah and its allies. In presenting his lineup on Thursday, Jan. 31, the Sunni prime minister apologized to the Lebanon people for the long delay in forming a government. He omitted to mention that the World Bank had threatened to transfer to Jordan the $4bn loan allocated last year to Lebanon unless a government was set up in Beirut. He said only, “All the problems are known and the cause of the corruption and waste and administrative deficiency are also known,” and went on to promise “bold reforms” which remained unspecified. Neither did he refer to the breakdown of public services across the country, including medical care, water and power supplies and the garbage pilling up in the streets. But most glaringly, Prime Minister Hariri’s message to the nation failed to spell out who really ruled the country and into whose hands it had fallen. In the wake of vicious civil wars, Lebanon’s Shiites, Sunnis and Christian Maronites ruled the country in uneasy equilibrium. However, in the last couple of years, four men were able to grab the centers of power, dominated by Hizballah’ secretary general Hassan Nasrallah. 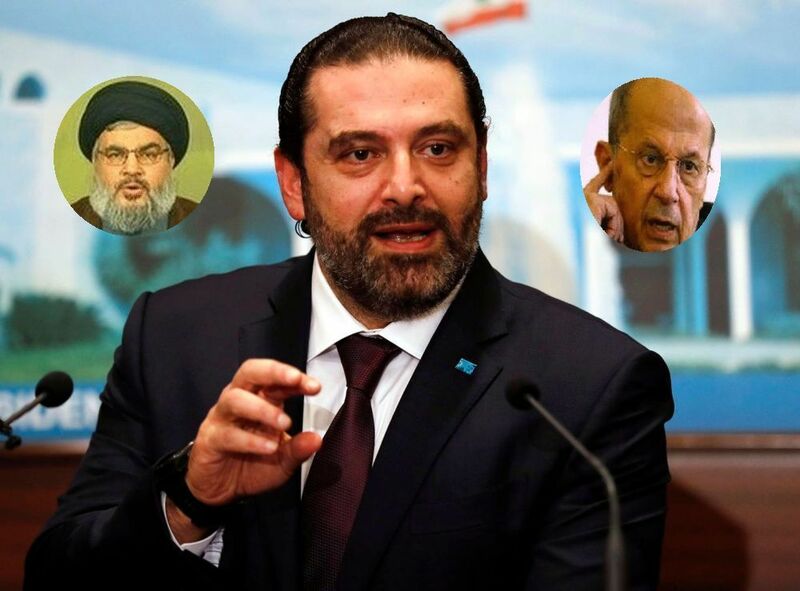 His partners are President Michel Aoun, a Christian who is loyal to Tehran, Damascus and Nasrallah; Foreign Minister Gebrane Bassile, the president’s son-in-law, who is Nasrallah’s obedient pawn, especially on the international stage; and commander of the Lebanese national army Gen. Joseph Aoun, whose every decision is governed by the president and the Hizballah leader. The prime minister did not admit that he is in the same boat. Israel’s Northern Shield operation for destroying Hizballah’s cross-border tunnels from Lebanon into Israel was one element in a masterplan devised by Prime Minister Binyamin Netanyahu with Washington to break up this formidable foursome. He presented the plan to US Secretary of State Mike Pompeo when they met in Brussels on Nov. 3. He explained that catching Hizballah red-handed for plotting an invasion of Israel was to have brought the Lebanese president and army chief under international pressure and, combined with Israel’s military operation, forced forced them to break ranks with Hizballah and deal with its dangerous tunnel project. Netanyahu further explained to Pompeo, that Hizballah’s weakened state after the destruction of its tunnels and legitimacy at home and abroad would substantially bolster the US-Israeli campaign for driving its master, Iran, out of Syria and the strengthen the impact of US sanctions on the Islamic regime in Tehran. Pompeo was convinced and told the Israeli prime minister to go ahead with Operation Northern Shield with Washington’s support. It was launched the following day, Nov. 3. But then, on December 19, when the operation was well underway, President Donald Trump bowled everyone over on Dec. 19 by his decision to pull US forces out of Syria. As a result, the White House, with the support of Defense Secretary at the time Jim Mattis, ordered Pompeo to hold off the planned economic and diplomatic measures for forcing the Lebanese president and army chief to take action against Hizballah and its tunnels. Trump decided against antagonizing the Lebanese army on the ground that it could be useful in smashing Islamic State remnants still present in Syrian regions bordering on Lebanon. The upshot of this episode was that Israel went against the tunnels without US backing, while Washington forfeited a major lever against Iran and Hizballah in Syria and Lebanon. All that was left to Washington after this episode was for US Assistant Secretary for Terrorist Financing Marshal Billingslea to warn Hizballah on Jan. 31, after a two-day visit to Beirut, not to use the new government as a cash cow for terrorist operations. This warning, however, will only make Hassan Nasrallah a bit more careful. He will make sure to put a dense smoke screen in place to camouflage the moneys flowing from the ministerial portfolios, two thirds of which are under his and his allies’ control, in support of his nefarious activities. When he dictated the lineup, Nasrallah grabbed the following portfolios: Treasury for Ali Hassan Khalil, member of the Shiite Amal movement and a trusted Iranian friend; Defense for Elias Bou Saab, a close crony of President Aoun and the Hizballah leader; Health, which commands large sums and grants from foreign sources, to Dr. Jamil Jabak; and Interior to Raya al-Hassan, the first woman to serve in a Lebanese government. Although a member of Prime Minister Hariri’s party, she is close to Hizballah. With Nasrallah in charge of Lebanon, Iran’s influence in Beirut is safely assured and provides Tehran with strong backup for deepening its roots in Syria in the face of Israeli and US efforts at removal.